Boo to You, Main Streeters! Tonight marks the official kickoff of the 2017 Halloween season at Walt Disney World. As we speak, the very first Mickey’s Not So Scary Halloween Party is going on, and I for one am excited. 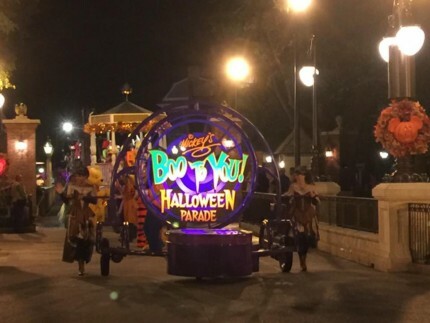 Halloween at Disney World is of course magical. Up until a few years ago, I had never attended one of the Halloween parties, but it was on my bucket list. Now that I’ve been to them, I can’t imagine a season where we don’t go, MNSSHP is on my must do list every Fall. I’ve been asked what my favorite part of MNSSHP is, and honestly, all of it is amazing. Seeing the Headless Horseman is awesome, and so is the Boo to You Parade that follows shortly after him. The Haunted Mansion section of the parade is my favorite. And the “Boo to You” song, oh boy, once it gets in your head it’s nearly impossible to forget. I was joking with my husband this morning that today begins two months of having “Boo to you and you and you and you, Happy Halloween” in my head! It’s catchy! Here’s the parade footage from last years opening night. Stay tuned for more coverage of Mickey’s Not So Scary Halloween Party, we will be heading to the party on Friday, September 1st! Happy Early Halloween Everyone!